Here at Babyology we love smart design, especially products that grow and change along with a child’s needs. 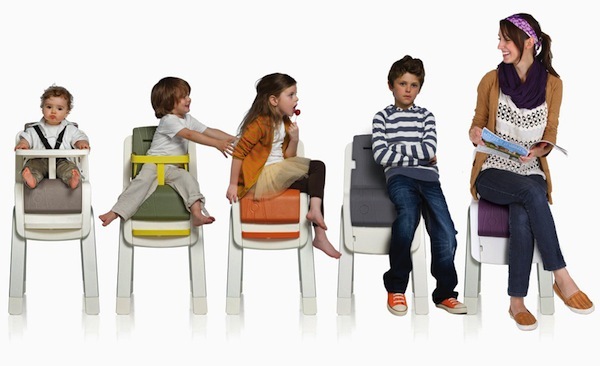 This Zaaz chair from Nuna is one of those items that has me wondering why all high chairs aren’t this smart. Even just in its high chair form it is pretty impressive – five point harness, adjustable tray, a crevice-free design that makes clean up super easy. Not to mention the removable bits and pieces that are all dishwasher friendly. Basically, it makes my high chair look pretty pathetic. But of course there’s more. When the child get a bit bigger, the Nuna Zaaz can be transformed into a safety chair with a three point harness to make dinner time a bit easier. When they grow bigger again the harness can be removed but the footrest stays on, making it a comfortable chair for little people and their usually dangling legs. Finally, by removing the footrest, it becomes a normal household chair that can hold up to 100kg. Oh, and I forgot to mention, it looks really cool. My favourite part is that you can easily change the height of the chair, so whether you’re stand up feeding or pulling bub up to the table to eat with the family, everyone is comfortable. You can buy the Zaaz for $312.55 from Izzz with free postage. If this takes you fancy you should also check out the review we did on Nuna’s Leaf Bouncer.